John Berggruen Gallery is pleased to present an exhibition of new work by California-based artist, Bruce Cohen. Bruce Cohen: Recent Paintings opens on February 7 and will continue through March 1, 2008. The gallery will host a reception for the artist on February 7, 2008 between 5:30 and 7:30pm. Bruce Cohen is often linked to the Contemporary Realism movement that emerged as a reaction to the increasingly popular abstraction of Modernism in the late 1960s and early 1970s. Realism, in general, indicates a strong attachment to the depiction of life as it is, without embellishment or subjective interpretation — and while, aesthetically speaking, the work of Bruce Cohen fits nicely within this genre, here exists inherent characteristics in his paintings that defy such particular categorization. This is due in large part to Cohen's life-long interests in Dutch still-life and Surrealism (particularly the work of Magritte, Dali, de Chirico, and Ernst), and his early study of Indian miniature paintings (which, according to Cohen taught him "order, compartmentalization, and love of surface decoration and special ambiguities, without the normal restrictions of Western Art"). 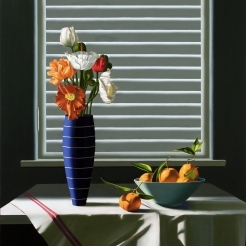 The influences of these interests are perceptible in Cohen's use of light and shadow, the alternation between muted and highly saturated colors, the intense and precise study of quotidian objects, the predilection to include mysterious exteriors that reveal themselves through open doors and windows, and the "strange dislocations of space" that mark his compositions. When coupled with the pervasive absence of human figures, the overall affect is the transformation of common scenes within seemingly prosaic interiors into imaginary worlds where objects in the foreground and the sky in the background are used both as markers for the passage of time and as silent relics of the human dramas that Cohen so masterfully implies. As artist Paul Wonner has written: "I feel sometimes that I am looking at a place where some tremendous, mystical event has just taken place. The people concerned have just moved on out of sight, but there remains on the scene the residue of a magic moment." Bruce Cohen was born in Santa Monica, California in 1953 and continues to live and work in Southern California. He graduated from the College of Creative Studies at the University of California, Santa Barbara 1975, after studying at both UCLA and UC Berkeley. Cohen has been the subject of numerous solo exhibitions at John Berggruen Gallery and has been included in exhibitions at the San Jose Museum of Art, the Los Angeles County Museum of Art, and the Solomon R. Guggenheim Museum of art, to name a few. He is represented in public and private collections such as Phillip Morris, New York, Pacific Bell, Los Angeles, the San Diego Museum of Art, and the Solomon R. Guggenheim Museum, New York.